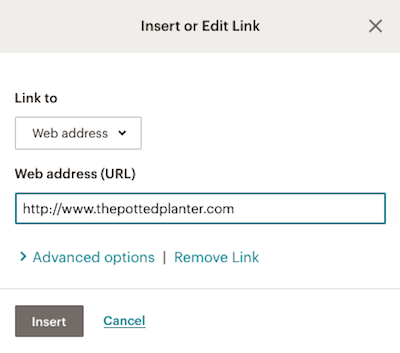 Use the editor toolbar in a Text content block to turn any piece of text in your Mailchimp campaign into a link. You can also link images or track links to see who clicks the links in your campaign. Insert the text you want to link and highlight it. In the Insert or Edit Link pop-up modal, click the drop-down menu and choose Web Address. Enter the click-through link in the Web Address (URL) field. The editor also supports keyboard shortcuts to add links. Highlight your link text and use CMD+K or CMD+L (Mac) or CTRL+K or or CTRL+L (PC) to create open the Insert or Edit Link pop-up modal. Links can direct your subscribers to a few different locations or options. Use the drop-down menu in the Insert/Edit Link modal to choose what you want to link in your campaign. Create a link to any website. The URL must be an absolute link that contains http://. To link text with a phone number, type tel:yournumber into the Web Address (URL) field. Linked numbers may not work on every phone, so test your campaign before you send. Create a mailto: link that allows you to set an email address to receive responses when subscribers click the link. Fill in the Message Subject and Message Body fields so the subject line and email body are automatically filled in when someone clicks the link to send an email. Use anchor links to create a table of contents in your campaign. Any files uploaded to Mailchimp can be linked to in a campaign to allow subscribers to download them. You can also use merge tags to create a link. When you set up your link, type or paste the merge tag into the Web Address (URL) field rather than a URL. 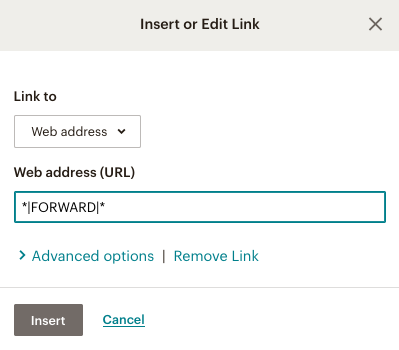 When you create links such as the Forward to a Friend option, use the *|FORWARD|* merge tag to automatically create a link to that form. To add a button instead of text or image link, use the Button Content Block. When you create a Mailchimp campaign, use the toolbar in the editing pane to apply styles to your links, such as underlining or text color. Font styles can also be set individually for each section of a campaign. In the Insert/Edit Link modal, click the Advanced Options drop-down link to set additional styling and behavior for your links. You can add a Title Attribute, set the CSS Class, and set the link to Open in a new window. The Title Attribute displays text when a recipient hovers over a link. The CSS Class allows you to define a class for the link, which requires that you add a CSS style section either to the template code or within the source code for a Text or Code content block. After you add the additional options, click the Insert button to apply the changes. Merge tag links, such as *|ARCHIVE|* or *|UPDATE_PROFILE|*, cannot be tracked in click reports. Because mailto: links go to an email program instead of a web page, they can't be tracked as clicks in your campaign reports. When you create a link in your campaign, we support mailto:, http, and https protocols. We don't support FTP links or mobile deep links. It's best to avoid shortened links in your campaigns, since these can sometimes trigger spam filters. Learn how to add a table of contents to your Mailchimp campaign, using merge tags or anchor links, so recipients can easily navigate through your content.